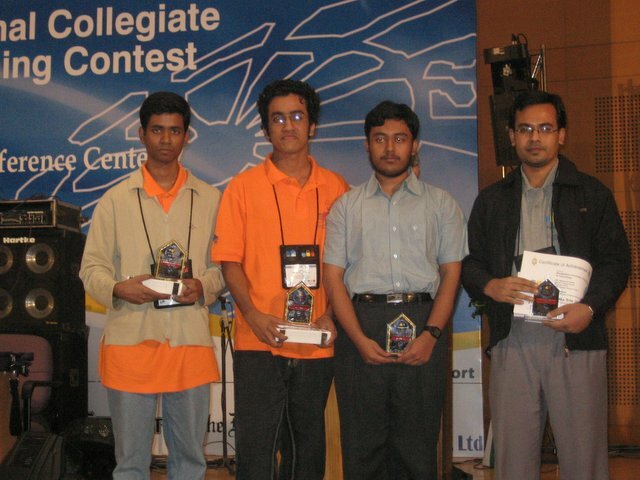 BUET Team ranked 1st in ACM ICPC (International Collegiate Programming Contest) Dhaka Site 2007. The contest was held in BCFCC on December 8, 2007. BUET Team has qualified for the World Final 2008 at Alberta, Canada in April 2008. Total 86 Teams from 33 Universities contested to take the pride to qualify for World Final 2008. BUET Sprinter showed a splendid performance by solving 7 problems out of 10 problems. The members of BUET Sprinter are Md. Mahbubul Hasan, Sabbir Yousuf Sunny, Shahriar Rouf and S. M. Hasibul Haque (Coach). Fudan University, China ranked 2nd and solved 6 problems. East-West University, Bangladesh ranked 3rd and solved 5 problems.